Sitecore expects an integer value to identify the channel id, which is used to identify the online store to retrieve from the channel database. The problem I faced was that the neither the Microsoft Ax Partner or the customer could give me the id, all they could find was the name which was a string value! This entry was posted in .Net, Commerce, Microsoft Dynamics, Sitecore, Sitecore Commerce Server and tagged .net, CDX, Channel Database Id, Commerce, Sitecore, Sitecore Commerce Server on November 11, 2015 by Alan Coates. Every time I have used AD for providing access to Sitecore, the active directory (AD) structure is crazy and recently I had a customer that had over 18000 roles, which made it difficult to assign roles and it killed the performance of the Sitecore client, as each user had at least 500 roles. Therefore Sitecore to evaluate the combination of a lot of roles to determine if they had read access or not. I talked to the department responsible for the AD setup about changing and or creating a folder that only contained the Sitecore related roles, but this was not possible. Initially I thought I would have to make own LDAP provider which derives from the standard provider, but I discovered this was not necessary as the LDAP module provides the functionality as standard. Custom Filter provide the ability to filter the roles and or users returned from the AD (see section 4.1 for full documentation).The custom filter uses the standard LDAP query syntax (see MSDN) to specify how the user or roles are filtered. According to Sitecore documentation, both the User and Role provider must have the same CustomFilter, and that is why the (objectCategory=person) is added so all users are also imported regardless of their name. I hope this blog post will help others using LDAP to control what roles or users are shown within sitecore. 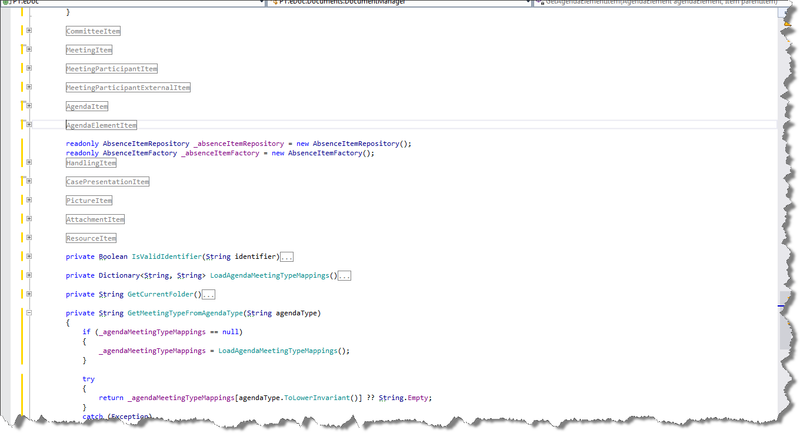 This entry was posted in .Net, Active Directory, LDAP, Sitecore, Sitecore 7.5 and tagged .net, Active Directory, AD, Constraints, Filter, LDAP, Roles, Search Filter Syntax, Sitecore, Users on June 29, 2015 by Alan Coates. Whilst reviewing a solution I came across the class in the image below, and felt the need for a rant about using regions. So a tip, if you need to use the #REGION’s in your code. I would advise you take a few moments and ensure that the class does not have mixed responsibilities. If it does have more than one responsibility you should split it up into a number of smaller classes with a clearly defined responsibility. This entry was posted in .Net, Bad code, Region and tagged .net, C#, Regions on April 22, 2015 by Alan Coates. After upgrading a solution from 6.6 to 7.5, I got the white screen of death when I tried to logon to the sitecore client. With the release of .net 4.5, they introduced a new control to represent a IFRAME (i.e. the html tag shown below) server control called HtmlIframe. In ASP.NET 4.0 or earlier an IFRAME server control will be represented by a HtmlGenericControl control. In ASP.NET 4.5 an IFRAME server control will be represented by a HtmlIframe control. The targetFramework attribute of the compilation element in the web.config defines which framework should be used, see below. Unfortunately due to another module in the upgraded solution the target framework attribute was removed, and therefore defaulted to .net 4.0 and so the types did not match. So I added the targetFramework=4.5, and the login page worked again. I thought it was a good idea with a quick blog as I guess I won’t be the first person to run into this problem. This entry was posted in .Net, Sitecore and tagged .net, .net 4.0, .net 4.5, 7.5, HtmlGenericControl, HtmlIframe, iframe, Login, Sitecore on October 27, 2014 by Alan Coates.